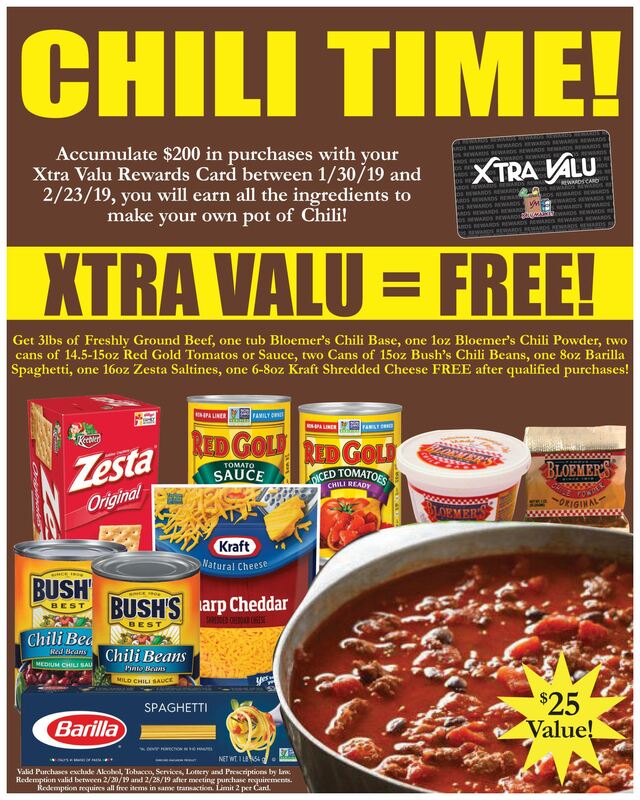 Accumulate $200 in purchases with your Xtra Valu Rewards Card between 1/30/19 and 2/23/19, you will earn all the ingredients to make your own pot of Chili! Get 3lbs of Freshly Ground Beef, one tub Bloemer’s Chili Base, one 1oz Bloemer’s Chili Powder, two cans of 14.5-15oz Red Gold Tomatos or Sauce, two Cans of 15oz Bush’s Chili Beans, one 8oz Barilla Spaghetti, one 16oz Zesta Saltines, one 6-8oz Kraft Shredded Cheese FREE after qualified purchases! Valid Purchases exclude Alcohol, Tobacco, Services, Lottery and Prescriptions by law. Redemption valid between 2/20/19 and 2/28/19 after meeting purchase requirements. Redemption requires all free items in same transaction. Limit 2 per Card.